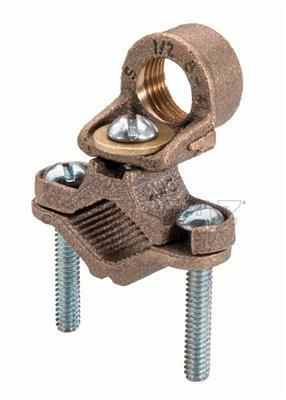 621 Ground Clamp For Rigid Conduit 1/2"- 1"
1/2" - 1" Ground Clamps for Rigid Conduit with Conduit Hubs - Conduit Size 1/2"
Make a secure connection with the threaded hubs of Topaz’s Ground Clamps for Rigid conduit. Designed for use when connecting Rigid conduit to water pipes for grounding. Bronze construction assures ground path continuity and excellent corrosion resistance. UL listed and available from 1/2” to 1” to 5” to 6”.